Ham and cheddar add smoky, cheesy charm to this fast and easy coleslaw recipe. Add to combined remaining ingredients in large bowl; mix lightly. Save 30 calories and 3g of fat, including 2g of sat fat, per serving when prepared with KRAFT 2% Milk Shredded Cheddar Cheese. 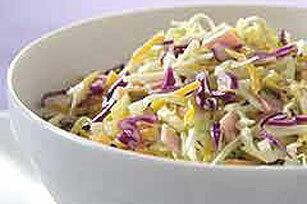 Substitute 8 cups shredded cabbage for the bagged coleslaw blend.